The breakthrough here seems to be the use of a stop-motion film that has garnered IBM the Guinness Book of World Records for World’s Smallest Movie. Of course, the scanning tunneling microscope (STM) has been with us for nearly 30 years, ever since Gerd Binnig first heard the beautiful noise of the STM tip following the an atom’s contours. And it’s been nearly a quarter-century since Don Eigler used an STM to move Xenon atoms around to form “I-B-M”. More recently, IBM has continued its ground breaking microscopy work by imaging atoms with the use of an atomic force microscope (AFM) in a technique known as Kelvin probe force microscopy (KPFM). This work allowed for the first time the imaging of charge distribution within a molecule and then for reaching the limits of AFM to image and manipulate hydrogen atoms. 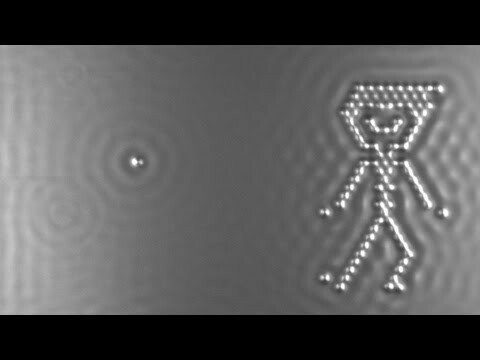 While all this breakthrough microscopy technology of IBM’s is impressive, this latest stop-motion film was not intended to sit along side these other works. Instead it appears to have been aimed at demonstrating IBM’s efforts in creating the next generation of data storage technology. Of course, IBM has a somewhat checkered past in applying its STM and AFM technologies to data storage, most notably Millipede Project, which went from being the Jane Eyre of mobile memory to the crazy first wife in the attic. Despite there not being a great deal of breakthrough science here, the short film does seem to have inspired both laymen and scientists alike to fall in love again with the allure of science in general and the nanoscale in particular. It’s sociologically fascinating that decades worth of brilliant science can’t garner as much interest as this short movie has quickly generated. I am not sure whether this is due to the power of cinema itself or people sensing—perhaps for the first time—they are actually witnessing what is invisible to the naked eye. Maybe if nanotech is to fully enter the popular culture, IBM should collaborate with Disney. Nano-Pinocchio, anyone?